These days, regular people find themselves spending a lot more time in front of a camera. Whether it’s video conferencing apps to stay in touch, live streaming on social media, or participating in webinars, cameras are critical. Of course, any good photographer will tell you, the key to a great looking image is light. And let’s face it, the web camera on your computer or mobile device is just not that good. In most situations, I look downright scary, and practically nobody looks as good as they do in real life. Fortunately, the folks at Lume Cube have a reasonable solution. I got my hands on the brand new Lume Cube Air VC. It’s a drop-dead simple kit that makes folks look great on camera. What is a Lume Cube Air? The Lume Cube Air is an easy-to-use light. It’s the little sibling to the original Lume Cube which has been a secret tool that photographers, video pros and social media creators have used for years. 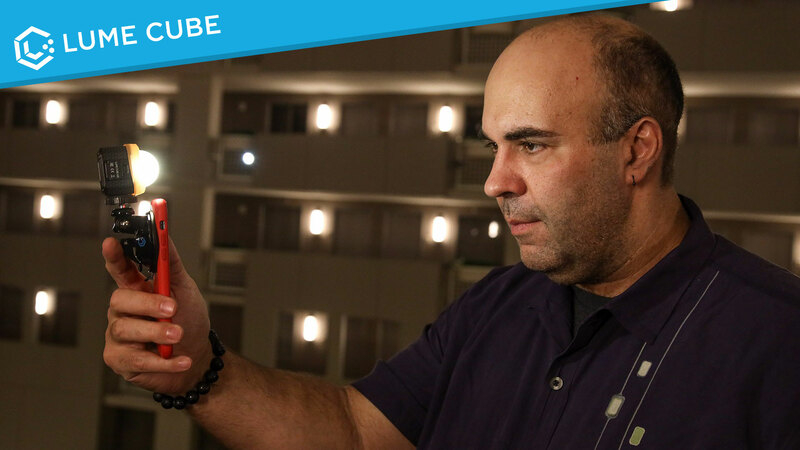 The Lume Cube Air is a small light that easily fits in the palm of your hand (1.6″ x 1.6″ x 1″ and weighs only 2 oz.). It’s got a magnet to mount it as well as a tripod thread mount. There are lots of cool features too for photography liking pairing to a phone and being waterproof, but let’s stick to this cool new use case. I love it when setting up a new piece of gear takes 90 seconds. From unboxing to use this was pure simplicity and joy. Step 1: Open the box. There are no awkward packaging and no scissors needed. Just lift a flap and tear along a perforated line. Step 2: Attach the mount. Screw the suction cup mount onto the light. Step 3: Pick your spot. I mounted the light onto both a laptop and a smartphone. For the smartphone be sure to but the light to the side and not over the top. This keeps the adjusting knob away from the back facing camera. Step 4: Add diffusion. Two supple silicone diffusion sleeves are included. One is soft white and the other is a great amber to warm the skin tones. Both soften the lift nicely to minimize reflections, open up shadows and soften bags under the eyes and (bonus) smoothing skin. Step 5: Power it up. Press the power button to turn the light on. You can tap the power button to cycle the power from 25% – 50% – 75% – 100%. Step 6: Want more control? The free Lume Cube app is awesome. With the light powered on, I launched the app. It immediately picks up the light via Bluetooth and proximity. Click OK, and it’s paired. Now you can dial in the strength between 0-100%. You’ll also find advanced controls for photography. The built-in battery will last for a long while (4-5 hours at 25% intensity). This was plenty of light because it’s so close to the subject. Plus it charges via USB so you can leave it plugged into your iPhone, iPad or computer for extended use or to charge. Damn! This thing works well. From out of the box to finished setup this thing was a breeze. The results using the Lume Cube Air VC simply look amazing. My hotel room’s harsh overhead lighting was solved by using this light. Walking and talking for a FaceTime call home looked great. I Skyped with a client about an upcoming job. I also used it for Facebook Live. This thing works. A lot of folks think you only need lights in lowlight situations. The truth is even in brightly lit scenarios the light fills in shadows on your face with beautiful, soft light. Plus the additional benefits for extra light on set for photo and video projects make this a no-brainer. I already keep four Lume Cubes in my camera bag, plus two in the car, and two more in my SCUBA bag. We’ve got a bunch of articles here for photo workflows here to inspire you. If you use a web camera or mobile device for any type of capture, especially streaming or video conferencing, you need this tool. Notes: We reviewed an advance release model of the kit. Availability is limited right now but try here to get one.